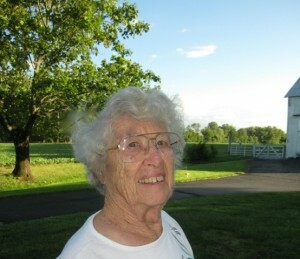 Dorothy Bryan has been a resident of Hopewell Valley since she was two years old. She attended Hart’s Corner School, the grammar school that is now Tollgate Elementary and Pennington Central High School which is now the Board of Education building on South Main Street in Pennington and graduated from Trenton State Teacher’s College in 1948. She and her husband Charlie were married in 1951 and continued the family tradition of farming on roughly 200 acres of what is now the Mercer Meadows on Federal City Road. They raised hay, corn, oats and soybeans to feed our dairy cows. She also gave farm tours to local children. Avid travelers, she and Charlie have traveled to all 50 states and participated in agricultural tours around the world. They were delegates to the “People to People” tour to China with 25 other farmers with the N.J. Secretary of Agriculture. Dorothy enjoys the outdoors and loves tending to her vegetable garden. She canes chair seats and installs splint seats., enjoys crossword puzzles, Sodoku and painting pictures from her photos using watercolor paints.